What did people put on their floors in the 50s and 60s? 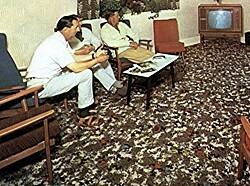 For many, wall to wall carpeting was a luxury to which they could aspire. Their choice ran from bold primary colours to random abstract patterns that drew inspiration from the modern art scene of the 50s. This sophisticated living room (above) has Mies van de Rohe's Barcelona chair in brown leather. There is an abstract spider's web pattern for the carpet, which is made from synthetic fibres. If you were into contemporary furniture you chose a bold, abstract patterned carpet to complement it. A favourite combination from the fifties and early sixties was a grey and black carpet flecked with randomly arranged splashes of different colours.. The inspiration may have been modern art or the 'Cocktail Cherry' look popularised at the Festival of Britain in 1951. 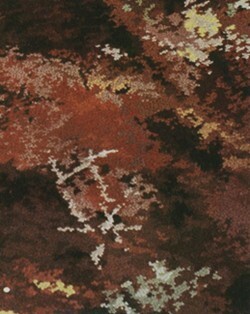 The Jackson Pollock inspired carpet, above, is in a hotel lounge in Torquay. (It's not the hotel made famous by John Cleese.) The carpet picks out bold reds, blues and yellows. This matched the late fifties and early sixties furnishing style of mixing and matching different bright colours. The traditional Axminster weave was able to combine a large number of different colours in a single carpet. This made it ideally suited to the traditional floral patterns that is often associated with the name. The Axminster was also just as suited to the modern abstract patterns favoured in the sixties. This carpet, left, is from the mid sixties. It shows a move away from the grey combined with bright colours of the fifties. 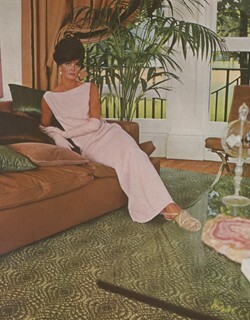 In the sixties, browns and more autumnal shades competed with brighter colours. This look would often be combined with Scandinavian style teak furniture in a modern sixties home. People still bought traditionally styled Axminsters in the sixties, to go with reproduction or real antique furniture, which had a strong following. An alternative to the abstract look were bright, primary colours. Reds, blues and yellows were favourite choices for carpet colours. 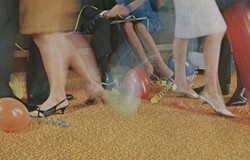 In the sixties people worried as much about spilling things on the carpet, as the colour of the carpet itself. 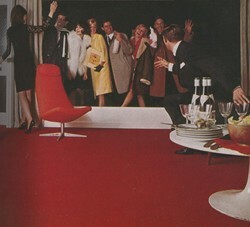 Any new carpet had to be swinging sixties party proof. Many of the advertisements stressed the miracle of modern man made fibres that meant spilling drinks on the carpet was no longer the nightmare it once was. Carpet patterns tend to change very slowly over time. A carpet is a significant investment. It would be difficult to find sixties style patterns around today. To get some of the look, choose bright, primary colours. Two shades combined in the same carpet were popular in the sixties and are obtainable today. "Do you buy items..I have a carpet circa 1970's...in axminster....I can provide a photo if so. "Hi there. We have an Axminster carpet for sale circa 1980's. Would you be interested?